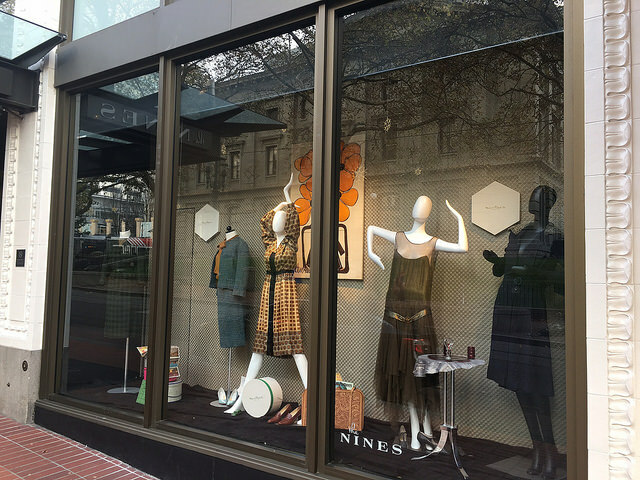 PORTLAND, Ore. – A collection of vintage clothing and accessories from the original Meier & Frank Department Store in downtown Portland is returning to the historic building this fall in a new window display designed by Oregon State University students. The display, which showcases the history of the Meier & Frank Building and fashion through time, was installed in a space made available to OSU’s College of Business by The Nines Hotel, which occupies the building’s top floors. The window is located on Morrison Street to the right of The Nines entrance. Oregon State is The Nines’ newest neighbor in the iconic Meier & Frank Building. The university is leasing the second floor of the building for its new Portland Center. Classes began in the freshly remodeled, 39,509 square-foot space in September. The partnership between the university and The Nines blossomed from a “new neighbor” meeting between College of Business Dean Mitzi Montoya and Jean-Marc Jalbert, The Nines’ general manager. OSU’s College of Business is home to the university’s design programs, including apparel design, interior design, design management, merchandising management and retail management.. The college also is offering undergraduate and graduate business degrees in a hybrid in-person/online format at the new Portland center. The pieces featured in the display window were chosen from among hundreds in the university’s Historic and Cultural Textile and Apparel Collection. The collection was started in the early 1900s when professors began bringing their personal artifacts to OSU for use in class instruction and display. “They thought it would be helpful to have these pieces to help students learn about textiles and apparel, including fabrics and construction,” said Dawn Figueroa, the collection curator. The artifacts began to take shape as a formal collection in the late 1940s when students and scholars took notice of the collection’s value and began cataloguing and preserving the pieces. In the years since, collectors and donors have worked to fill gaps in the collection to create a cohesive array of clothing and textiles, including fabric samples, tapestry fragments and accessories from many cultures. The collection, which is stored on the OSU campus in Corvallis, includes Euro-American clothing and accessories such as purses, shoes and hats from the 19th and 20th centuries. A non-Western collection includes clothing and textiles from the 15th through 18th centuries and some pre-Columbian pieces. Figueroa, who has a background in museum work, has spent the last few years updating and digitizing the catalogue. She has photographed and catalogued more than 1,500 pieces and estimates she has about 800 pieces remaining. 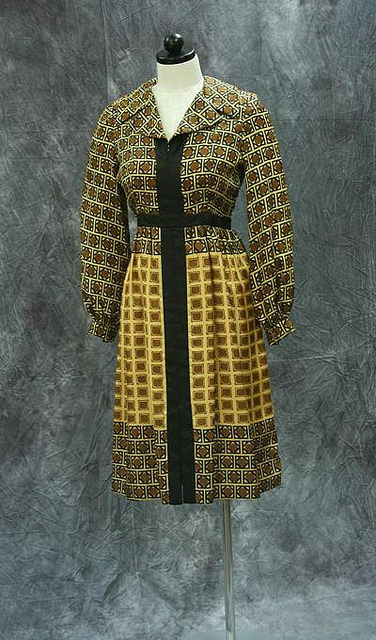 Through a partnership with the OSU Library, the updated catalogued items, including photographs, are now also available as a scholarly resource through a digital archive online at https://www.oregondigital.org/sets/textile-and-apparel. 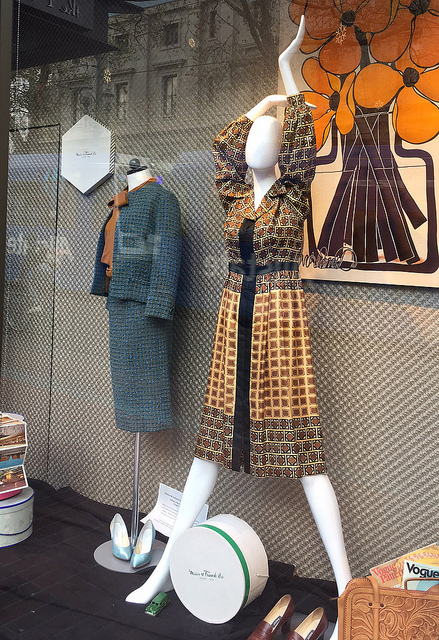 For the window display at The Nines – the hotel’s name stems from the phrase “dressed to the nines,” in a nod to its location in the former department store building – Figueroa and student Leah Jaeger wanted to focus on pieces with ties to the department store. Figueroa searched the digital archive for items tagged “Meier & Frank,” which pulled up a number of pieces that were original designs from the store or were purchased there. The options include a range of formal wear, women’s day wear and accessories, including pieces designed exclusively for Meier & Frank and designer pieces from Oscar de la Renta, Vera Maxwell and others. “We had a range of pieces, dating from the 1920s to the 1970s, but we’re only able to use about six pieces in the window,” Figueroa said. The display also includes accessories and a panel of text to provide information for the window-gazers strolling by, said Jaeger, a senior apparel major from the Eugene area who took the lead on the window design. Jaeger, who is interested in a career in historical fashion or museum work, recruited a friend and classmate, Jordan Farris, to assist with the display. The display is expected to remain in place for about three or four months, through the busy holiday shopping season. There may be opportunities to showcase additional pieces from the OSU collection in the space in the future, as well, said Nancy Clayton, director of sales and marketing for the hotel.